"Accurate Kitchen & Bath Design"
Note... Old mid 1970's "horseshoe" style kitchen, "closed-off" from the rest of the condo. New design... Open feel galley style kitchen. Removed left entrance wall, moved sink base, removed the coveted "luma-dome" ceiling, added taller upper cabinets with crown. added base cabinets in the dining area. 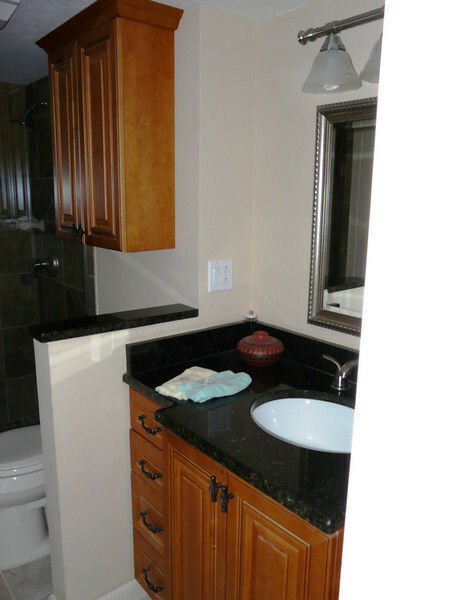 Two bathrooms... new cabinets & granite counters, note the new tile showers with framless glass doors.. "Beautiful !! " New.. Cut wall down to feel more spacious, beautiful new cabinets and counters. Note.. Georgous all tile shower with frameless glass.